The Judge Advocate General's Corp, often referred to as JAG, can advise and aid in most instances where an attorney would be sought out, including but not limited to personal legal matters, debt collection, tax filing and family matters. 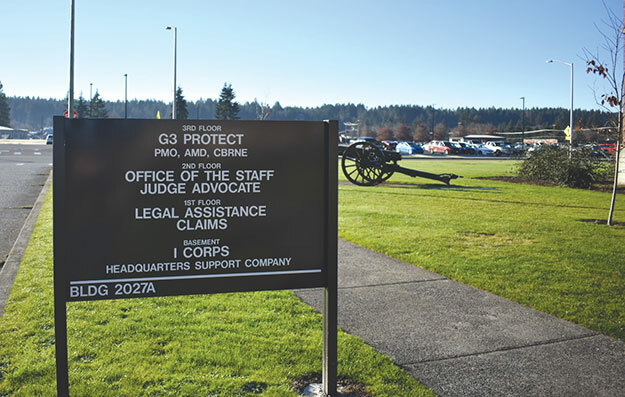 The legal assistance office at Joint Base Lewis-McChord provides free, confidential legal services to active-duty servicemembers, their dependents and retirees. "We are trying to save soldiers as much money and time as possible and to keep them legally ready and happy in their lives, so they can focus on other things -- their children, their work, the Army's mission. Legal services off post are expensive, so any savings we can provide for them is the goal of the office." said Capt. Joseph DeFlorio. The most common services the legal office provides for servicemembers and their families fall under Administrative Services. These include drafting Powers of Attorney (POA), notarization services and composing wills. They also encourage bringing in contracts for leases or loans before you sign, as a preventative measure to ensure you are not being taken advantage of or scammed. The military attorneys at JBLM are also very knowledgeable on the Servicemembers Civil Relief Act (SCRA), and can explain your rights when breaking leases or contracts due to PCSing, ETSing, and deployments. They can explain your rights to reduced interest rates through SCRA and give financial advice. JAG services also cover family law, including divorce, child custody, alimony and adoptions. Spouses are able to make an appointment unaccompanied to seek legal advice, and are eligible to the same services available to servicemembers. Coming late January, the legal assistance office will be opening its doors, again, for free tax return filing, including advice on new tax laws and codes. The office will employ 30 returners to meet the demand, and will be taking appointments and walk-ins Monday-Friday, 8 a.m. to 7 p.m.; and Saturdays, 9 a.m. to 4 p.m. Their location is different this year than last, and you can find them at 6230 Pierce Ave. on JBLM, near the Stone Education Center. To make an appointment, call 253.967.1040. All of the Judge Advocates on JBLM have graduated from accredited law schools and have been licensed to practice law. However, there are limitations to the services they are able to provide. Overly complex tax returns may result in a referral to a Certified Public Accountant (CPA). Another instance where you may be referred to a specialized attorney would be if you needed to be represented in court. JAG services can advise and aid up to a certain point, and then provide you with a list of recommended attorneys to represent you. Capt. Patrick Barr of Legal Assistance explains, "This office can provide a good launching pad to make an educated decision as to what your next step should be -- not just, ‘I'm going to hire an attorney because I think I have to.'" If you think you might need an attorney, the Legal Assistance Office should be your first stop. The Legal Assistance attorneys are ethically obligated to hold every conversation in confidence and welcome servicemembers, their family members and retirees the use of their services via walk-in or by appointment Monday-Friday, 9 a.m. to 4:30 p.m. Appointments typically book three to 10 days out, but simpler needs such as notary services can be completed in as little as five minutes as a walk-in. If you're seeking legal assistance and advice, take advantage of the amazing resources the legal assistance office at JBLM offers.